Includes huckleberry, peppercorn, thyme, blood orange, and liquor flavored simple syrup recipes. Simple syrup is so called because it’s…well…simple. A base simple syrup is nothing more than 1 part water to 1 part sugar. Use simple syrup to sweeten cold drinks like lemonade, cocktails or hibiscus tea without endless stirring. Dab it onto cakes before you frost them to help keep them moist. It’s also an essential part of sorbet recipes. Mix the water and sugar in a saucepan and bring to a simmer on the stovetop to dissolve the sugar. Once dissolved, remove from heat and you have made simple syrup. 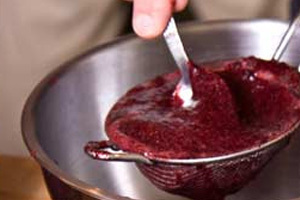 Add ¾ cup huckleberry puree (from blending fresh huckleberries or frozen huckleberries) to the above simple syrup. Simmer 1 ½ tbsp whole Tellicherry peppercorns in simple syrup on the stove for 3 minutes. Strain out the peppercorns and discard. This method can be used to make other spiced simple syrups using other whole spices like star anise, although the amount and simmering time may vary. Simmer 1 cup each water & sugar on the stove with ten sprigs of thyme (stirring frequently) until the sugar dissolves, then bring the mixture to a boil and cook for five minutes. Warm thyme simple syrup (recipe above) on the stove. Stir in blood orange juice to taste and briefly simmer. Most simple syrups found in traditional cakes and tortes are flavored with liquor. Make a basic simple syrup, and let it cool to lukewarm. Stir in the liquor of your choice to taste. Then dab the simple syrup on your cake or torte before frosting in order to keep it moist. I did this with the Tahitian vanilla bean from the spices sampler I received in the fall Perfect for coffee, iced black tea, or vanilla flavored Italian sodas.